Coins in sanctuaries: Note Caligulan coinage. There is still, however, no clear consensus on whether demonetization was carried out. An immediate and total recall would hardly have been practical, since there was no de facto damnatio. On the other hand, Claudius may have wanted, most likely for personal reasons, to erase any memory of the hated Emperor. 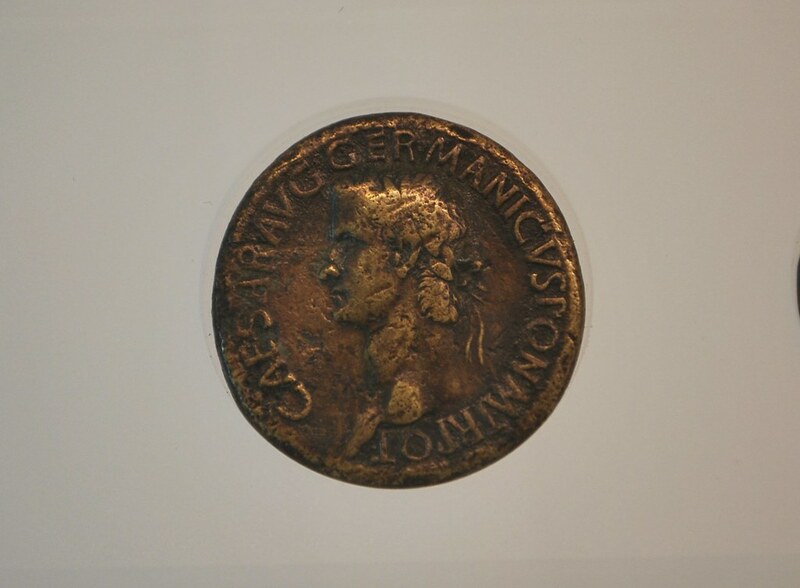 A Caligula sestertius with the 'C' in "C CAESAR" having been filed away in ancient times. Scratches across reverse - damnatio? 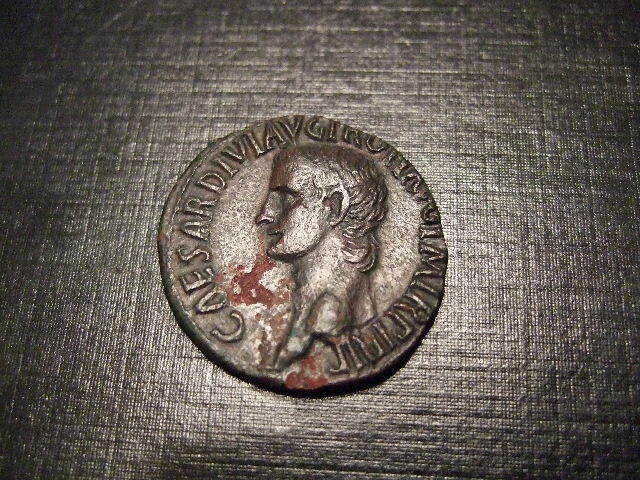 A Caligula sestertius with the 'C' in "C CAESAR" having been filed away in ancient times. The seller does not mention this in the description, its odd, but I look at the "C" in all Caligula's AE's first thing. I am now after not documenting for the first 15 years, adding them as I find them. 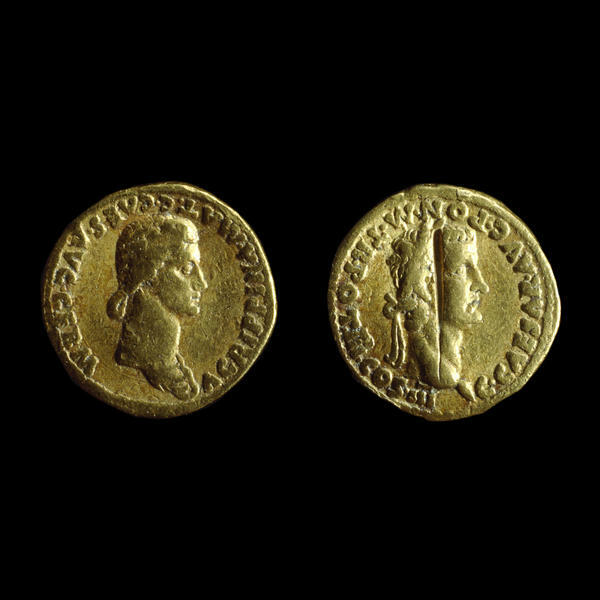 Agrippina and Caligula- Was this coin defaced or was someone checking the gold content? Caligula, 37 - 41 n. Chr. Denar (3,54 g.), 37 - 38 n. Chr. Mzst. unbekannt. Vs.: C CAESAR AVG GERM P M TR POT, Kopf des Gaius n. r. Rs. 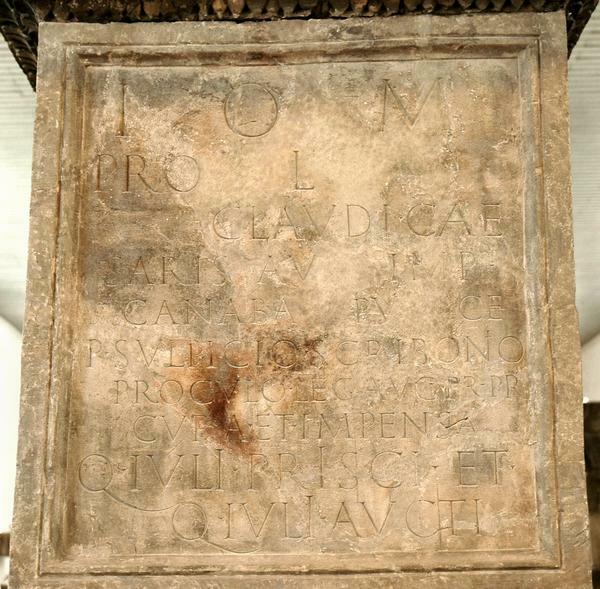 : AGRIPPINA MAT C CAES AVG GERM, drapierte Büste der Agrippina n. r. RIC vgl. 8. Subärat, inoffizielle Prägung! 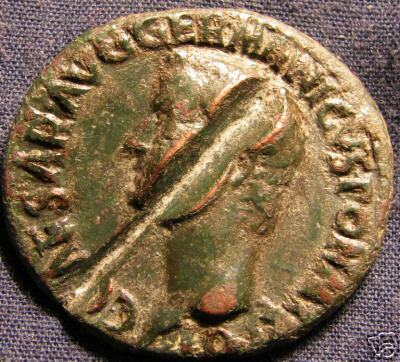 The obverse of a Caligula 'Vesta' AS with the 'C' in the inscription having been filed away in ancient times. (Gary photo) I have seen more of the Caligula Vesta bronze types with the chiseled "C" in "C CAESAR" than any other form of damnatio on Caligula' bronzes. I have seen at least 20 Vesta bronzes that have damnatio damange like this at coin shows. 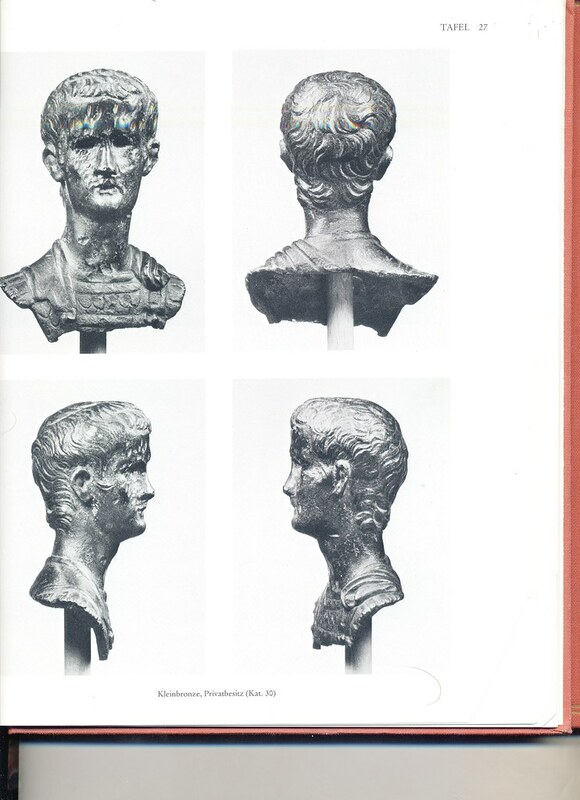 It probably helps I am looking for the Damnatio on Caligula's bronzes. No other Julio Claudian princeps has the number of damnatio attempts as Caligula. 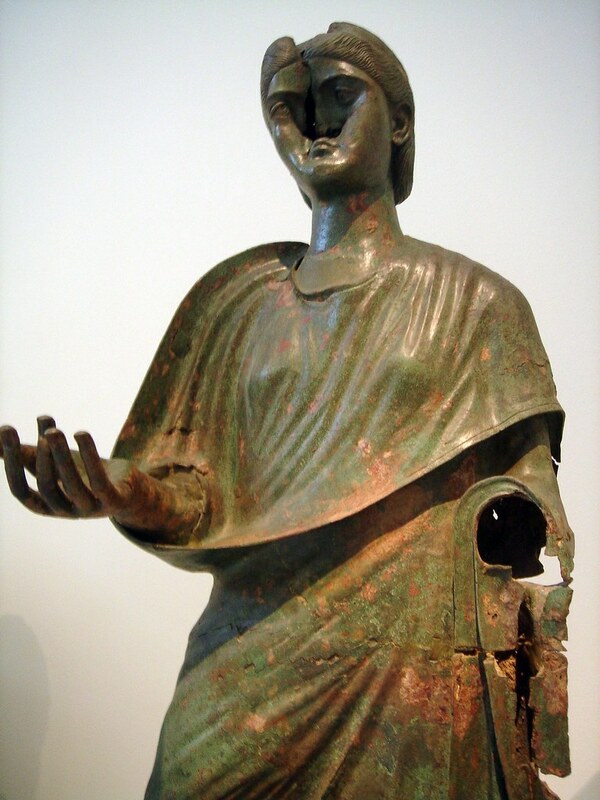 Nero should also have similar damnatio attempts, but in my research I do not see them. 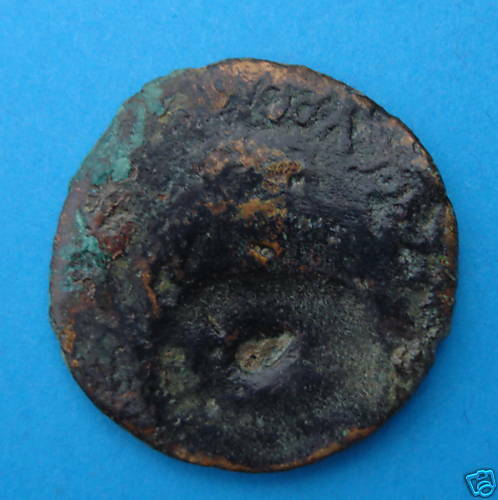 Neronian damnatio attempts seem to be on monuments and inscriptions but not so on coins. 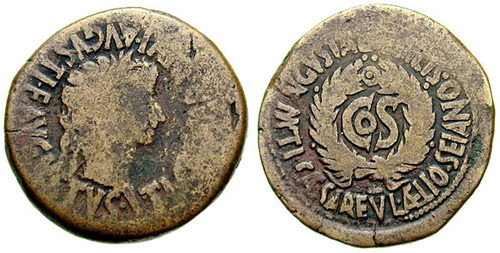 Nero needs further study in damnatio attempts in regards to numismatics. 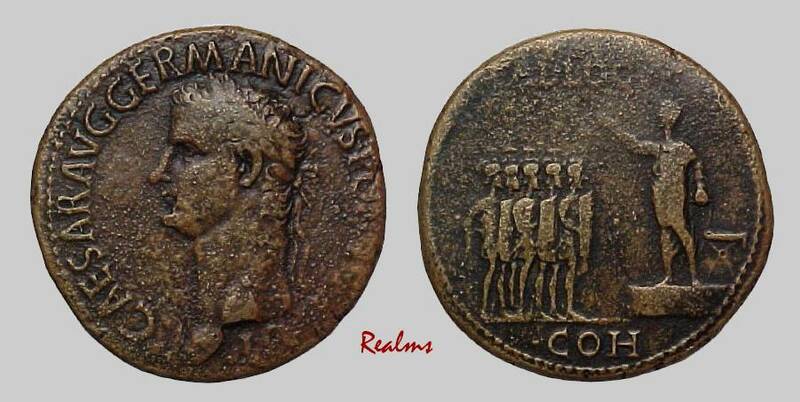 Here is a damnatio sestertius of Caligula I just ran across today, again the seller has no idea, but this seem to be the pattern and choice in the first century of damnatio of Caligula coins. Chisel off the first "C" in "C CAESAR". Of the 45-60 coins I have seen over 80% are exactly like this. I'm a little obsessed with Caligula coins, so I have noticed over the last 25 years. Nero and Drusus Caesar dupondius (struck under Caligula) with "C" in "C CAESAR" obliterated. (photo by Gary). Caligula from Carthago Nova. Puncture mark in neck. Note the defacement across the face by the ear and nose. 4 slashes across face? Caligula AE sestertius. Struck 37-38 AD. Obverse: C CAESAR AVG GERMANICVS PON M TR POT, laureate head left. Reverse: S P Q R/P P/OB CIVES/SERVATOS in four lines within oak wreath. RIC 37; BMCRE 38; Cohen 24. A wonderful obliterated coin with his father Germanicus defaced badly. Caligula Vesta AS with gash attempt to Damnatio of "C" in Caesar and face. 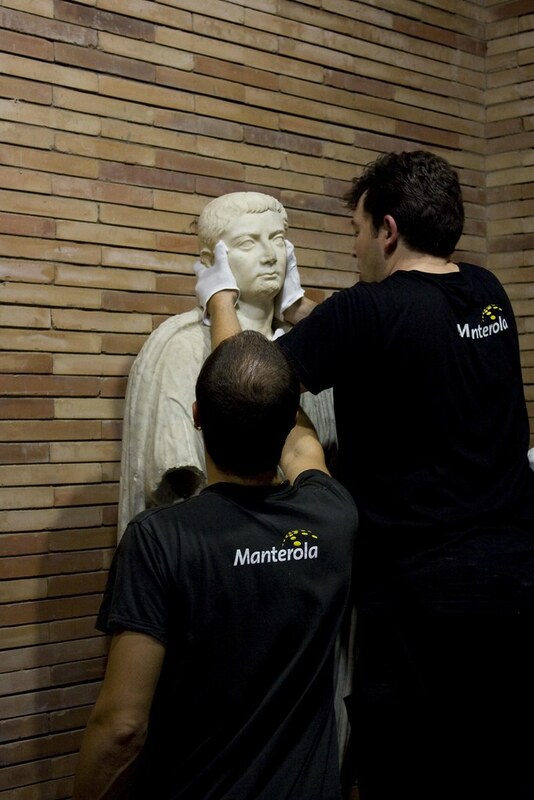 Youthful Nero with Neck Damnatio? SPAIN, Bilbilis. Tiberius. 14-37 AD. Æ 27mm (10.84 g, 6h). L. Aelius Sejanus, praetorian consul. Struck 31 AD. Laureate head right / MV (ligate) AV(ligate)GVSTA BILBILIS TI CÆSARE V [L ÆL]IO [SEIAN]O, large COS across field within wreath. RPC I 398; SNG Copenhagen 620. 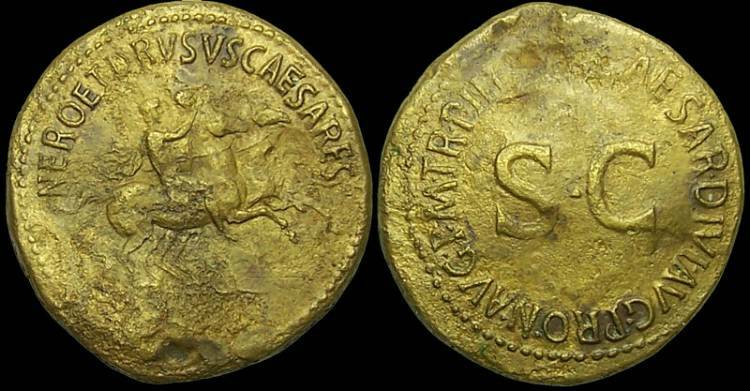 Now at 4 oclok you can see name of the dreaded Sejanus has been obliterated on this specimen. SPAIN, Bilbilis. Tiberius. 14-37 AD. Æ 27mm (10.84 g, 6h). L. Aelius Sejanus, praetorian consul. Struck 31 AD. Laureate head right / MV (ligate) AV(ligate)GVSTA BILBILIS TI CÆSARE V [L ÆL]IO [SEIAN]O, large COS across field within wreath. RPC I 398; SNG Copenhagen 620. Important historical type with the name of Sejanus removed in damnatio memoriae. Note Damnatio attempt!! Even rarer are head and body belonging together. Photo courtesy John Pollini. 80 by 26 1/2 by 19 1/2 inches. This is an actual Damnatio attempt that was not originally successful? Since the head and body belong together, the break was attempted, and thankfully the head and body survived. 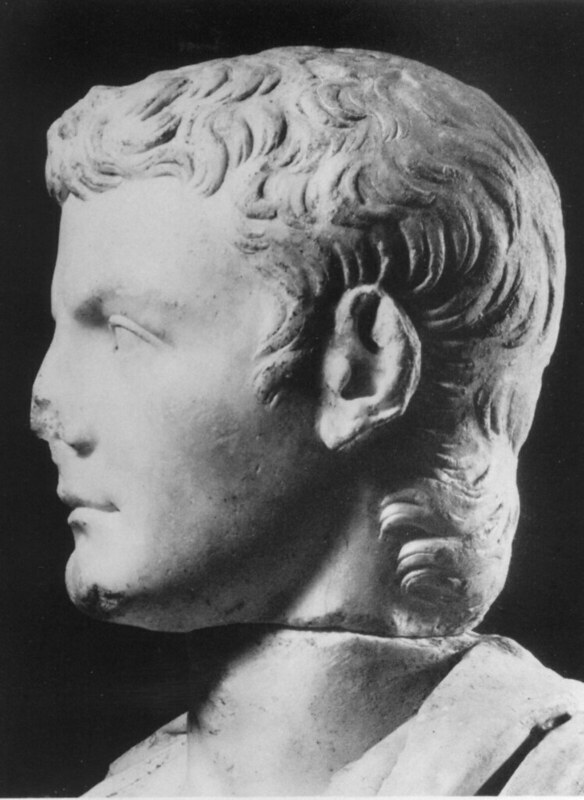 Bronze portrait of Caligula that was found in the Tiber river. 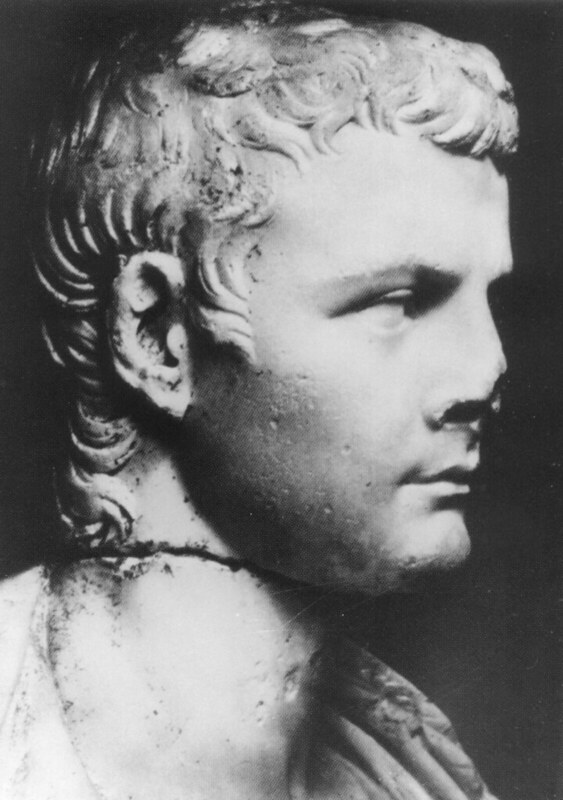 Note: Mutilated face on Caligula. From: Die Bildnisse des Caligula, (1989) Boschung, D. Educational Use Guidelines. Modern day Damnatio!! 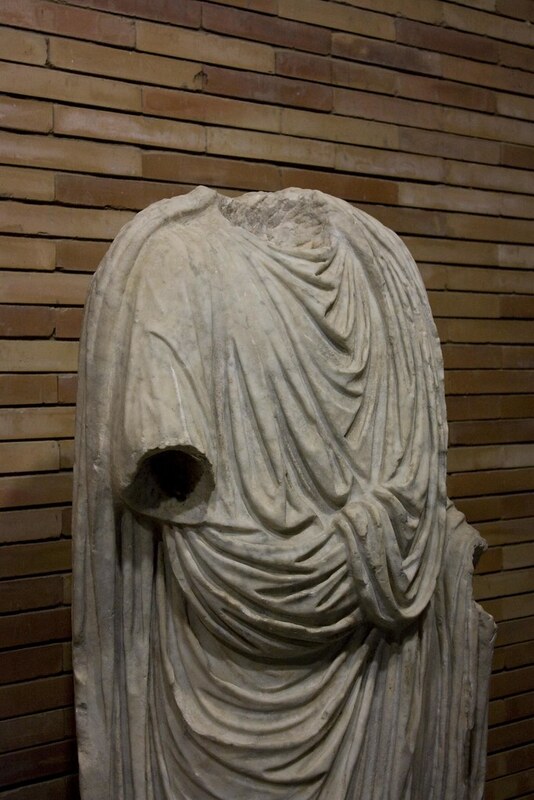 Drusus' head removed from a statue. Merida, Spain.